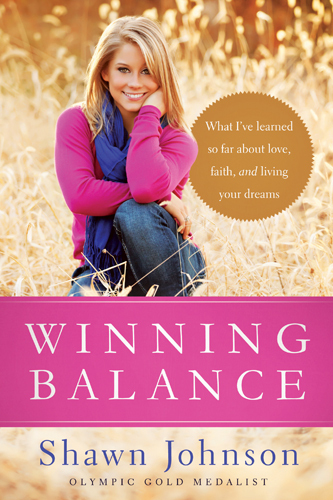 Olympic Gold Medalist Shawn Johnson shares a piece of her life and experience in a very personable and encouraging way. She talks in detail about gymnastics, but also her crushes on boys, her self image and weight pressures, her time on Dancing with the Stars, her scary stalker, and the injury that nearly cost her her career. She shares many personal stories, thoughts, and poetry. This is really an inside scoop into her life, and I have to say: she has a winning personality. I love Shawn’s honesty, vulnerability, and the cheerfulness of her writing. It’s hard to read this and not become a fan. Since I haven’t closely followed gymnastics, I searched Google and YouTube for Shawn as soon as I had started the book to see what the media was saying. Most of her press is overwhelmingly positive–and I can see why!–but Shawn’s behind-the-scenes commentary completes and responds to her image in the media confidently and gracefully. I especially appreciated Shawn’s vulnerability in discussing her struggle with weight gain after the Olympics. Regardless of where God takes her in the future, Shawn is an amazing young woman with an excellent story.